You get the behavior you incentivize. That is why bribes work—and are illegal. And that is why the government offers financial incentives—bribes of its own—for “whistleblowers” who report misconduct. Pharmaceutical and medical device companies have traditionally focused their compliance efforts on federal healthcare laws, such as the anti-kickback statutes and regulations from the Food and Drug Administration and U.S. Department of Health and Human Services. The qui tam provisions of the False Claims Act have created an effective incentive for reporting violations by healthcare companies. But there are other anti-corruption laws out there and other incentives for reporting violations. Healthcare companies should ensure that their compliance efforts factor in all relevant anti-corruption laws and provide their own incentives for internal reporting of potential violations. Domestic anti-kickback laws provide criminal penalties for remunerations, including bribes and kickbacks, paid to doctors or hospitals in return for referrals or purchases reimbursable under government healthcare programs. But companies doing business abroad must also be wary of the Foreign Corrupt Practices Act (FCPA), which prohibits offers or payments to “foreign officials” for the purpose of securing an improper advantage to obtain or retain business. The U.S. government takes the view that doctors practicing in countries with government-subsidized medical care are “foreign officials.” The FCPA also requires public companies to maintain accurate books and records and to devise and maintain an adequate system of internal accounting controls to prevent improper payments. FCPA violations are pursued as criminal matters by the Department of Justice (DOJ) and civil matters by the Securities and Exchange Commission (SEC). Healthcare companies that manufacture, sell, market, import, or export their products abroad must have compliance programs that address the risk of FCPA violations to avoid the harsh penalties that result from them. Companies doing business abroad have the additional risk of running afoul of foreign anti-corruption laws. The United Kingdom’s Anti-Bribery Act, for instance, goes beyond the FCPA and includes a new strict liability offense for companies that fail to prevent bribery by an employee, agent, or subsidiary. The U.K. law, however, offers a safe harbor for those companies that try to prevent bribery with an effective compliance program. In fact, corrupting payments by U.S. companies to anyone run the risk of violating laws against commercial bribery. Payments that may not violate the technical requirements of the Anti-Kickback Act or FCPA can still violate one of the more general anti-bribery provisions. Most states have laws forbidding commercial bribery, and the general federal anti-fraud statutes have long been used by federal prosecutors to pursue all manner of bribes and kickbacks, whether or not a foreign official or a federal reimbursement program is involved. While healthcare companies have traditionally focused on qui tam actions, with the enactment of the Dodd-Frank Wall Street Reform and Consumer Protection Act, individuals who assist the SEC in uncovering securities violations, including violations of the FCPA, can receive a payoff of 10 to 30 percent of the fines collected. Given that FCPA-related penalties exceeded $1.8 billion in 2010, the financial incentive for whistleblowers to report FCPA violations to the government is enormous. Make sure that someone has actual responsibility for ensuring that prohibited payments are not made. Compliance officers who focus on FDA compliance may or may not be the right person—or have the bandwidth—for the job. But someone has to actually see to it that the proper training, auditing, and enforcement occur so that improper payments do not. The person charged with that responsibility should have direct access to the company’s board of directors. Integrate the policies and procedures designed to ensure compliance with the Anti-Kickback Act with those intended to ensure compliance with the FCPA and the U.K.’s Anti-Bribery Act. It is not enough to have policies that describe those laws and demand compliance. Write policies that set limits on the kind of conduct that often ends up violating those laws. For example, explicit policies should limit gifts, travel, entertainment, cash advances, and the use of company credit cards. Those policies should be written not just with an eye to controlling expenses but also with an eye to preventing bribes. And make sure there are procedures in place, and being executed, to ensure that those policies are followed, violations are detected, and appropriate remedial measures are taken. Companies using intermediaries abroad need to ensure that their anti-corruption policies and procedures explicitly address the increased FCPA risk inherent in doing business internationally. Make sure that employment questionnaires and the due diligence of potential employees or business partners specifically address FCPA concerns, including relationships with foreign officials. In the current regulatory environment, improving your compliance programs could be an excellent investment. As state and federal governments cover more and more individuals under their various healthcare programs, there is an ever-increasing scrutiny by government prosecutors of payments and compensation arrangements between healthcare professionals (and their institutions) and medical device and pharmaceutical companies. This increased scrutiny is reflected in recent legislation as well as increased enforcement of broad anti-fraud laws, such as the Federal Anti-Kickback Statute and Civil False Claims Act, that has resulted in highly publicized settlements by device and pharmaceutical companies that collectively amount to billions of dollars. In December of last year, Exactech, Inc. settled a kickback claim with the government for $3 million. The government alleged that the company used consulting agreements with physicians as “vehicles” for kickbacks to induce physicians to purchase the company’s products. These arrangements included fee-for-service contracts, fixed-fee contracts, and product-development contracts. In November 2010, ELA Medical executed a $9.2 million settlement agreement with the government to resolve kickback violations. The government alleged, among other things, that the company paid doctors $2,500 to $4,000 for each patient enrolled in a study, even though the patients did not know they were part of a study. In September 2010, Wright Medical settled kickback claims with the government for $7.9 million. The government alleged that Wright Medical used consulting agreements to induce surgeons to purchase and use the company’s orthopedic devices. Not only was each of these cases settled for millions of dollars, each company also likely incurred millions in defense costs, as well as significant disruptions to its business. Small, privately held, venture-backed companies that are commercializing products are among the companies receiving government subpoenas, and having their marketing programs and relationships with physicians targeted for possible violations of the Anti-Kickback Statute. Therefore, it is important for senior management, boards of directors, and venture investors who fund private, commercial-stage, life sciences companies to understand the broad prohibitions of the Anti-Kickback Statute and the types of interactions with and payments to healthcare professionals that may trigger a prolonged Office of Inspector General (OIG) investigation. The Anti-Kickback Statute makes it illegal for device and pharmaceutical companies to offer or give anything of value to any person or entity to purchase any product or service that is reimbursed by the government (e.g., under or by Medicare/Medicaid). It is also unlawful for the companies’ customers—primarily physicians and healthcare institutions—to either solicit items of value from their vendors or to receive them when they are offered. Thus, the law applies to both the vendor of devices and pharmaceuticals and to their healthcare customers. Several “safe harbors” are contained in the statute’s implementing regulations. However, only those who structure their business arrangements to satisfy all the criteria of a safe harbor will be immune from liability and prosecution. No one factor is dispositive, and given the interpretation of the law to date, the OIG has virtually unlimited discretion in selecting cases for enforcement. Additionally, federal courts and administrative bodies considering the law in the context of actual enforcement cases have established several important interpretive principles, including the following, some of which are now codified in recent healthcare reform legislation. The following is a quick, non-exhaustive list of DOs and DON’Ts for senior management, board members, and venture investors in private, commercial-stage, life sciences companies with respect to interactions with healthcare professionals. Some of these suggestions are codified in various statutes or regulations on the state or federal level. Others are incorporated in model codes of conduct for interactions with healthcare professionals promulgated by such organizations as AdvaMed and PhRMA. DON'T provide or pay for any healthcare-provider entertainment or recreational activity, or expenses associated with a business or educational activity. If meals are to be provided to healthcare professionals, DO ensure that they are modest, occasional, and incidental to the bona fide presentation of scientific, educational, or business information. DON'T offer meals as a recreational or entertainment event or to induce the purchase of a company product. DON'T provide meals on more than an occasional basis. DON'T provide meals to healthcare professionals who do not actually attend the presentation of scientific, educational, or business information, or to staff or guests. DON'T offer gifts of any variety or value to healthcare professionals or their staff. Providing items to healthcare professionals that benefit patients or serve a genuine educational function for healthcare professionals (and have a retail value of less than $100) on an occasional basis is permitted. DON'T give any type of non-educational, branded, promotional items (e.g., pens, coffee mugs) to healthcare professionals, even if the item is of minimal value. DON'T use raffles or other contests to provide gifts that could not be given directly. DO check with the company compliance officer regarding bans or restrictions on gifts under state and federal law and related reporting requirements. DO furnish company products to healthcare professionals for evaluation purposes for a limited period of time to allow for an adequate evaluation. DO enter into a written agreement with any healthcare professional who is being loaned medical devices for evaluation purposes. DON'T leave evaluation or demonstration products with healthcare professionals beyond the term of the agreement. DO comply with state and federal reporting requirements with respect to product samples. The company may pay for reasonable travel costs of healthcare-professional attendees when required for such purposes as plant tours or the demonstration of non-portable medical devices. Occasional modest meals and refreshments may be provided in connection with such meetings or meetings to discuss product features, sales, terms, or contracts. DON'T pay for the meals, refreshments, travel, or lodging of guests of healthcare professionals or any other person who does not have a bona fide professional interest in the information being shared. DO direct physicians or researchers with grant proposals that are for genuine, independent, medical research to the compliance officer/grant review committee for review. DON'T use the sales force to solicit grant proposals or use such proposals as sales tools. DON'T propose or offer unrestricted grants. Be sure to specify a bona fide business, charitable, or educational purpose. DON'T propose consulting agreements with healthcare professionals that are intended to induce the sale, or reward the purchase, of the company's products. DO submit all proposed consulting agreements to the compliance officer for prior approval. DO engage consultants only to provide services for which there is a legitimate need, which is identified in advance. DO ensure that any consulting arrangement has a corresponding written consulting agreement that is entered into prior to the start of the services and prior to payment. DO pay consultants fair market value for services that are needed and actually provided, and only enter into royalty arrangements if the healthcare professional has made a novel, significant, or innovative contribution to the development of a product. DO pay consultants for documented, reasonable, and actual expenses incurred by them carrying out services under a written consulting agreement, including reasonable and actual travel, modest meals, and lodging costs incurred by consultants attending meetings with, or on behalf of, the company. DO adequately document the need for any healthcare-professional training and education and submit all documentation to the compliance officer prior to the training. DO provide training and education programs only in settings that are conducive to the effective transmission of information. DON'T interfere with or influence the conference sponsor's independent control of the selection of program content, faculty, educational methods, materials, or attendees. The company may recommend a knowledgeable faculty member where such a recommendation is permitted by the conference sponsor's guidelines. DO collaborate with healthcare professionals, patients, and organizations representing their interests to achieve government and commercial payer coverage decisions, guidelines, policies, and adequate reimbursement levels to allow patients access to company products. DON'T provide information for the purpose of unlawfully inducing healthcare professionals to prescribe, purchase, lease, recommend, use, or arrange for the purchase or lease of the company's products. Senior management, boards of directors, and investors in private, commercial-stage, venture-backed, life sciences companies must understand that the OIG does not limit its investigative activities to large, publicly traded, life sciences companies. Failure to ensure compliance with current laws and standards for interactions with healthcare professionals can trigger unwanted OIG scrutiny. If you have any questions about these issues, please feel free to contact David Hoffmeister, Farah Gerdes, Kristen Harrer, or Jon Nygaard at Wilson Sonsini Goodrich & Rosati. The table below includes data from 2010 life science transactions in which Wilson Sonsini Goodrich & Rosati clients participated. Specifically, the table compares—by industry segment—the number of closings, the total amount raised, and the average amount raised per closing across the first and second halves of 2010. The data generally demonstrates that venture financing activity declined during the second half of 2010 compared to the first half. Specifically, the total number of financing closings completed across all industry segments during the second half of 2010 decreased by approximately 3.5 percent compared to the first half, from 86 closings to 83 closings. More significantly, the total amount of money raised across all industry segments during the second half of 2010 decreased by more than 29 percent compared to the first half. The biopharmaceuticals and medical device and equipment industry segments, which together represent more than 85 percent of all life science financing closings, suffered the largest declines in average amount raised during the second half of 2010 compared to the first. Biopharmaceutical companies raised approximately 38 percent less money on average in the second half of 2010, while medical device and equipment companies raised approximately 28 percent less money on average. Other data from our recent transactions suggests that of all financings completed for our life sciences clients in 2010, including equity financings, bridge financings, recapitalizations, and other non-traditional types of financings, the percentage of Series A equity financings remained at 23.3 percent across both the first and second halves of the year; the percentage of Series B equity financings decreased from 15.1 percent in the first half of the year to 13.3 percent in the second half; the percentage of Series C (and later) equity financings decreased from 23.3 percent in the first half to 18.3 percent in the second half; and the percentage of bridge financings decreased from 33.7 percent in the first half to 31.7 percent in the second half. The decrease in Series B and Series C (and later) equity financings and bridge financings was offset by an increase in the number of recapitalizations and other non-traditional types of financings during the same periods, suggesting that traditional middle-to-later-stage equity financings and bridge financings are in decline—an alarming fact for many middle-to-later-stage companies that require additional capital to achieve regulatory approval or some other value-driving event, which may be critical to securing the next round of financing or a positive liquidity event. The upshot, however, is that later-stage companies that were able to secure equity financing during the second half of 2010 received a higher average pre-money valuation than later-stage companies that secured equity financing during the first half of the year. Recent data from our transactions indicates that the average pre-money valuation of later-stage equity financings increased from $57.1 million in the first half of 2010 to $75 million in the second half. This increase may be explained in part by an increasing presence of less valuation-sensitive, corporate strategic investors, who were the source of 11.5 percent of total venture capital provided to life science companies in the second half of 2010, compared to 3 percent in the first half. On the other hand, our data suggests that the average pre-money valuations for Series A and Series B equity financings dropped from $18.5 million and $44 million, respectively, in the first half of 2010 to $5.9 million and $20 million, respectively, in the second half. That represents a decrease of 68 percent and 54 percent, respectively, and suggests that those early-stage companies that were fortunate enough to raise equity financing during the second half of 2010 endured significantly more dilution, dollar-for-dollar, than similarly situated companies that raised equity financing during the first half of the year. Overall, the data indicates that access to venture capital for life science companies declined in the second half of 2010 compared to the first half, and the fundraising environment remains difficult in early 2011. While it is too early to tell what the remainder of 2011 will hold for life science companies, management and investors may take some comfort in knowing that the sluggishness in venture capital activity is not unique to life science companies, as venture capital activity across all industries slowed down during the second half of 2010 relative to the first half. After all, the percentage of venture capital investments made in life science companies during the second half of 2010 remained unchanged from the first half of the year at approximately 25 percent. The Patient Protection and Affordable Care Act1 established a limited-time federal tax credit and grant program designed to reimburse up to 50 percent of eligible R&D expenditures incurred in 2009 and 2010 by small employers for qualifying therapeutic discovery projects (QTDP program). The legislation authorized up to $1 billion in investment tax credits and cash grants through the QTDP program for life sciences companies with no more than 250 employees to help defray the costs of biomedical research. Eligible companies applied for and were selected to receive such credits or grants through a competitive certification process. The Internal Revenue Service (IRS) required that awards be directed to projects that show reasonable potential to: (1) result in new therapies that either treat new areas of unmet medical need or prevent, detect, or treat chronic or acute diseases or conditions; (2) reduce long-term healthcare costs in the United States; or (3) significantly advance the goal of curing cancer within the next 30 years. Moreover, in selecting award recipients, the IRS took into consideration which projects have the greatest potential to create and sustain (directly or indirectly) high-quality, high-paying jobs in the United States and advance U.S. competitiveness in the fields of life, biological, and medical sciences. In making this determination, the IRS considered to what extent a project would either: (1) produce a new or significantly improved technology, or a new application or significant improvement to existing technology, as compared to commercial technologies currently in service; or (2) lead to the construction or use of a contract production facility in the U.S. in the next five years. For additional details on the QTDP program application process and background, please see the May 24, 2010, WSGR Alert titled “Treasury Department Issues Guidance on Therapeutic Discovery Project Tax Credit and Grant Program for Small Employers,” available at http://www.wsgr.com/wsgr/Display.aspx?SectionName= publications/PDFSearch/wsgralert_irs_notice_2010-45.htm. The IRS initially estimated that 1,200 companies would submit applications, which, if split evenly, would have resulted in an average award of $0.8 million. The actual number of applicants significantly exceeded this estimate, and far more individual project applications—5,600—were submitted than expected. Without prior guidance, the IRS split the pot equally among all qualified projects, giving out 4,606 awards to 2,923 companies. Although at first blush it would appear that the IRS did not apply the criteria stringently (since 4,606 awards were made out of 5,600 applications, reflecting an 82 percent application success rate), we are aware that applicants went through a selection process, which included in some cases follow-up interviews and questions regarding the substance of the application and the status of the project and the company. The result of the pot-splitting was an award of $244,479 per project, well short of the expected $0.8 million and the QTDP program’s stated maximum available amount per company of $5 million. That said, there was no limitation placed on the number of projects that a single company was allowed to apply for and many applicants took advantage of this fact. The largest amount of money received by any single company was approximately $3.5 million. Although the IRS’s pre-billing of the QTDP program seemed to focus on a tax credit to help sustain small company research projects, the program also offered cash grants since many qualifying companies would have little taxable income to offset with credits. Of the $1 billion authorized by the program, the overwhelming majority was in the form of cash grants (approximately $19 million, or less than 2 percent, was in the form of tax credits). This is understandable since the QTDP program was designed to provide incentives to smaller, less mature, life science companies that would inherently be in the pre-revenue, R&D stage of their lifecycle. Ultimately, California companies took the largest share of the program’s funds, with more than $281 million. Massachusetts accounted for nearly $127 million, while Maryland, New Jersey, New York, North Carolina, Pennsylvania, Texas, and Washington each received more than $30 million. Approximately $100 million of the $1 billion, or 10 percent of the QTDP program’s dollars, was awarded to clients of Wilson Sonsini Goodrich & Rosati (242 companies out of the 2,993 recipients, or 8 percent). And in California, $71 million out of $278 million, or 26 percent, was awarded to our clients. We would like to take this opportunity to congratulate all of our well-deserving client recipients. The breadth of the U.S. life sciences industry was evident in the diversity of cash grant and tax credit recipients. Examples include oncology drugs, cardiovascular drugs, Alzheimer drugs, vaccines, stem-cell-based products, implantable products targeting a range of anatomies, drug delivery technologies, molecular diagnostics, imaging tools, catheter-based medical devices to treat a range of diseases, medical equipment, and many more. The $1 billion made available through the QTDP program is equivalent to approximately half of the total investment made by venture capital firms in 234 U.S. medical device companies during the second quarter of 2010—a significant amount of money put into play by the government at a time of economic uncertainty and severe capital-raising challenges. While many recipients were disappointed with the amount received on a per-company basis, we believe that a substantial number of important projects that otherwise struggled to obtain adequate capital in 2010 were given the opportunity to fight another day with the assistance of these additional funds. As a tool to sustain innovation in the United States, the QTDP program may only have played a small role, but given the lack of other available resources for life sciences companies, it may well have been at a critical time. The way we assess value in medical technology is changing radically. The old dynamic of the physician as arbiter of value is giving way to a new one: government and private insurers and “self-pay” consumers increasingly determine what sells and at what price. They refuse to pay for incremental innovations that add bells and whistles but do not significantly improve health or reduce cost. The faster, better, smaller, cheaper advances so common in consumer electronics portend the future of medical technology. Emerging-market countries such as China, India, and Brazil, despite comparatively less well-developed healthcare system infrastructures, are quickly taking the lead in developing lean, frugal, and reverse innovation. This type of innovation simplifies devices and processes, retaining essential functions, while applying newer technologies that are more mobile, customized to consumers’ needs, and less costly. The innovation ecosystem for medical device technology, long centered in the United States, is moving offshore. Increasingly, medical technology innovators are going outside the United States to seek clinical data, new-product registration, and first revenue. U.S. consumers are not always the first to benefit from advances in medical technology and could eventually be last in line. Innovators already are going first to market in Europe and, by 2020, likely will move into emerging countries next before entering the United States. The nature of innovation is changing as developing nations become the leading markets for smaller, faster, more affordable devices that enable delivery of care anywhere and help bend the healthcare cost curve downward. However, the difficulty of doing business in emerging countries and concerns over intellectual property protection could make these markets less attractive to multinational companies, despite their size, and could hinder these nations’ innovation leadership. The Innovation Scorecard assesses the capacity of nine countries with strong medical technology market potential to adapt to the changing nature of innovation: Brazil, China, France, Germany, India, Israel, Japan, the United Kingdom, and the United States. As well as providing a current view of innovative capacity and capability, the Innovation Scorecard looks at the past five years to gain a historical perspective and projects into the future to present the outlook for 2020. 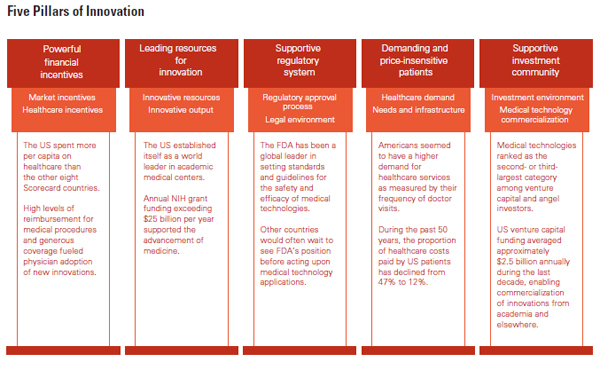 The Innovation Scorecard combines 86 metrics to calculate the current score and 56 for the historical. These metrics range from objective to subjective and help to identify trends in medical technology innovation. The United States at 7.1 (on a scale of 1 to 9, with 9 as best) holds a leadership position. Because of decades of innovation dominance, the United States demonstrates the strongest capacity for innovation in the medical technology market. The scores of the other developed economies (United Kingdom, Germany, Japan, and France) fall within a tight band of 4.8 to 5.4. Among the European countries included in this study, France demonstrates the weakest support for innovation. Israel, despite a population of only 7.5 million, ranks near the level of the European nations included in this study. The medical technology industry has long recognized Israel’s strong capacity to foster innovation. Developing economies lag behind developed ones. China, with its superior economic growth engine, scores 3.4, ranking it higher than India and Brazil, which each score 2.7. Looking at past scores and the outlook for the future along with current scores changes the perspective and reveals that although the United States will hold its lead, the country will continue to lose ground during the next decade. The Innovation Scorecard also projects declines for Japan, Israel, France, the United Kingdom, and Germany. China, India, and Brazil will experience the strongest gains during the next 10 years. Of the nine countries, China, which has shown the strongest improvement in innovative capacity during the past five years, is expected to continue to outpace other countries and reach near parity with the developed nations of Europe by 2020. During the past 50 years, the United States has provided an ideal innovation ecosystem that has fostered significant advances in medical technology. U.S. dominance of this industry stems from its strength in five innovation pillars, which form a structure for the Innovation Scorecard. China, ranking second in number of research professionals, has nearly as many as the United States and twice the number as Japan. 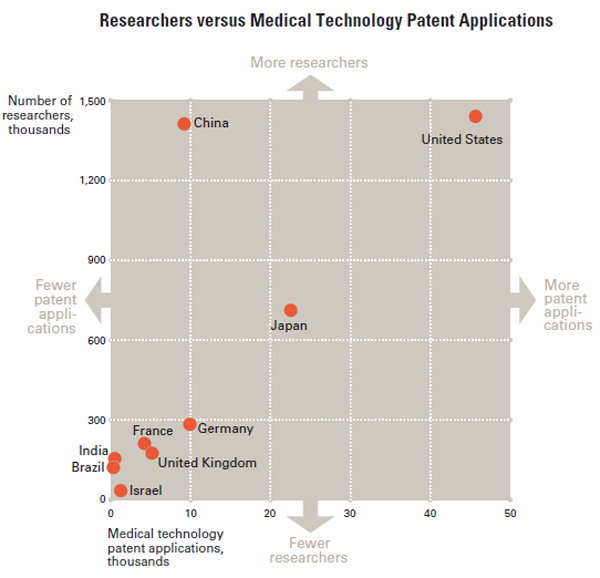 Yet China has not been as productive in obtaining medical technology patents. The United States obtains more patent applications, averaging more than 44,000 per year, but Israel and Japan lead in filing medical technology patent applications on a per capita basis. If China were as productive as the other countries, it could produce the second-largest number of medical technology patents in the world. Who Will Take the Lead in 2020? Although the United States should maintain its lead in medical technology innovation for years to come, long-term U.S. dominance is no longer assured. The supportive ecosystem that fostered this dominance creates inherent limits to change, encourages an incremental and less radical path to innovation, and discourages innovations that could transform healthcare’s cost structure and deliver greater value. Radical innovations that have a greater chance to bend the cost curve are more likely to emerge from developing countries such as China, India, and Brazil. View the full report at www.pwc.com/InnovationScorecard. PwC’s Pharmaceuticals, Medical Device and Life Sciences Industry Group (pwc.com/us/pharma and pwc.com/us/medtech) is dedicated to delivering effective solutions to the complex strategic, operational, and financial challenges facing pharmaceutical, biotechnology, and medical device companies. The firm provides industry-focused assurance, tax, and advisory services to build public trust and enhance value for its clients and their stakeholders. More than 161,000 people in 154 countries in firms across the PwC network share their thinking, experience, and solutions to develop fresh perspectives and practical advice. Christopher Wasden, Managing Director, Strategy and Innovation Practice, PricewaterhouseCoopers, is the author of “Medical Technology Innovation Scorecard - The Race for Global Leadership.” He can be reached at (647) 471-6090 or via email at christopher.wasden@us.pwc.com. The sale of private company shares on the secondary market is becoming increasingly prevalent as the timeline to reach a liquidity event has lengthened over the last decade. In order to proactively manage secondary transactions, the boards, management teams, and investors of these companies need to be aware of the relevant issues, challenges, and considerations. Unlike public markets, where information-disclosure rules are well established, rights and privileges of existing investors are limited, and securities laws are well defined, the world of secondary share sales in private companies is much less understood. Saints Capital, with contributions from Wilson Sonsini Goodrich & Rosati, has published A Guide to Secondary Transactions: Alternative Paths to Liquidity in Private Companies. Saints Capital has been an industry leader in secondary transactions for over 10 years, and during that period the organization has been approached numerous times with questions about the rationale, process, legal implications, and operational consequences of a secondary transaction. Wilson Sonsini Goodrich & Rosati is pleased to represent Saints Capital in connection with a number of transactions. information disclosure to a potential secondary buyer. What issues should a board of directors consider in a secondary transaction? What are the potential legal implications of a secondary sale? When should someone consider a secondary transaction? What are the different structural alternatives in a secondary transaction? How are secondary shares valued? Who are the different secondary buyers? Please visit http://www.saintsvc.com/from.html to view A Guide to Secondary Transactions: Alternative Paths to Liquidity in Private Companies. About Saints Capital: Saints Capital is a leading direct secondary acquirer of venture capital and private equity investments in emerging growth companies around the globe. Saints Capital also makes traditional direct venture capital investments on a primary basis and in special situations in technology, healthcare, consumer, and industrial companies in the United States. Founded in 2000, Saints provides liquidity for private investors in such markets as investment and commercial banks, buyouts, corporate venture capital, and hedge funds. Saints has more than $1 billion of committed capital under management, over 50 completed portfolio transactions, and investments in more than 200 companies. More information about Saints Capital can be found on its website at http://www.saintsvc.com/. On February 22, 2011, Gilead Sciences, a biopharmaceutical company that discovers, develops, and commercializes innovative therapeutics in areas of unmet medical need, and Calistoga Pharmaceuticals, a biotechnology company focused on the development of medicines to treat cancer and inflammatory diseases, announced the signing of a definitive agreement under which Gilead will acquire Calistoga for $375 million. Calistoga could earn up to an additional $225 million if certain milestones are achieved. Gilead anticipates that the deal will close in the second quarter of 2011, subject to the satisfaction of certain closing conditions. Wilson Sonsini Goodrich & Rosati advised Calistoga in the acquisition. To read the companies’ joint press release, please visit http://www.calistogapharma.com/pdf/Calistoga2.22.11.pdf. On February 15, 2011, Boston Scientific Corporation, the worldwide developer, manufacturer, and marketer of medical devices, announced its intent to acquire ReVascular Therapeutics, a company that produces an intraluminal peripheral chronic total occlusion (CTO) crossing device. The worldwide launch of the device in approved markets is planned for later this year. The acquisition adds a technology platform that complements Boston Scientific’s portfolio of devices for lower extremity peripheral artery disease. Wilson Sonsini Goodrich & Rosati advised ReVascular Therapeutics in the transaction. To read the Boston Scientific press release, please visit http://bostonscientific.mediaroom.com/index.php?s=43&item=989. On February 10, 2011, Fluidigm Corporation announced the pricing of its initial public offering of 5,558,333 shares of its common stock at a price to the public of $13.50 per share. The shares of common stock have been approved to trade on the NASDAQ Global Market under the symbol “FLDM.” Deutsche Bank Securities and Piper Jaffray & Co. are acting as joint book-running managers for the offering. Cowen and Company and Leerink Swann acted as co-managers. Wilson Sonsini Goodrich & Rosati is advising Fluidigm in connection with the transaction. To read the Fluidigm press release, please visit http://www.fluidigm.com/february-10-2011.html. On February 4, 2011, Endocyte, a biopharmaceutical company developing targeted small-molecule drug conjugates, announced the pricing of its initial public offering of 12,500,000 shares of its common stock. All shares were sold at an initial public offering price of $6.00 per share, before underwriting discounts and commissions. The common stock is trading on the NASDAQ Global Market under the symbol “ECYT.” Wilson Sonsini Goodrich & Rosati is advising Endocyte in connection with the transaction. To read the Endocyte press release, please visit http://www.endocyte.com/pdf/2011%2002%2004_IPO%20Press%20Release.pdf. On January 13, 2011, Medtronic, a global leader in medical technology devices, announced that it has completed the acquisition of privately held Ardian, a developer of catheter-based therapies to treat hypertension and related conditions. Under the terms of the agreement announced on November 22, 2010, the purchase price is $800 million in cash up front, plus additional cash payments equal to annual revenue growth through the end of Medtronic’s fiscal year 2015. Wilson Sonsini Goodrich & Rosati advised Ardian in the transaction. To read the Medtronic press release, please visit http://www.ardian.com/pdfs/Ardian%20closing%20news%20 release_FINAL_01_13_2011.pdf. On January 10, 2011, Teleflex, a provider of medical technology products, announced that it has acquired privately held VasoNova, the developer of a unique central venous catheter-navigation technology, in a transaction valued at up to $55 million. Under the terms of the agreement, Teleflex will make an upfront payment of $25 million and additional payments of between $15 million and $30 million based upon the achievement of certain regulatory and revenue targets over the next three years. Wilson Sonsini Goodrich & Rosati advised VasoNova in the transaction. To read the Teleflex press release, please visit http://www.teleflex.com/en/usa/spotlight/vasoNova/index.html. On December 31, 2010, iCAD, an industry-leading provider of advanced image analysis and workflow solutions for the early identification of cancer, announced that it has completed the previously announced acquisition of Xoft, developer of the Axxent eBx electronic brachytherapy system. iCAD acquired 100 percent of the outstanding stock of Xoft in exchange for approximately 8.65 million shares of iCAD common stock and approximately $0.8 million in cash to certain Xoft stockholders, for a total consideration at closing of approximately $12.9 million. Wilson Sonsini Goodrich & Rosati represented Xoft in the transaction. To read the iCAD press release, please visit http://www.icadmed.com/newsevents/xoftcomplete.htm. On December 20, 2010, Lpath, a therapeutic antibody company, announced that it has entered into an agreement to provide Pfizer with an exclusive option for a worldwide license to develop and commercialize iSONEP, Lpath’s lead monoclonal antibody product candidate, which is being evaluated for the treatment of wet age-related macular degeneration and other ophthalmology disorders. Under the terms of the agreement, Lpath will receive an upfront option payment of $14 million and will be eligible for $497.5 million in development, regulatory, and commercial milestone payments. Wilson Sonsini Goodrich & Rosati represented Lpath in the transaction. To read the Lpath press release, please visit http://phx.corporate-ir.net/phoenix.zhtml? c=197881&p=irol-newsArticle&ID=1509317&highlight=. On December 15, 2010, genetic-analysis technology company Affymetrix announced that the U.S. District Court for the Western District of Wisconsin has granted its motion for summary judgment that Affymetrix does not infringe patents asserted by its competitor, Illumina. The court directed that two patent infringement lawsuits brought against Affymetrix by Illumina be dismissed and the cases closed. Illumina had filed the lawsuits in May and November 2009, alleging that Affymetrix’s GeneTitan instrument and array-plate-format microarrays infringe its patents. Wilson Sonsini Goodrich & Rosati represents Affymetrix in the matter. To read the Affymetrix press release, please visit http://investor.affymetrix.com/phoenix.zhtml?c=116408&p=irol-newsArticle&ID=1507891&highlight=. On December 8, 2010, regenerative medicine company Mesoblast Limited and global biopharmaceutical company Cephalon announced that they have entered into a strategic alliance to develop and commercialize novel adult stem cell therapeutics for degenerative conditions of the central nervous and cardiovascular systems. Under the terms of the agreement, in exchange for exclusive worldwide rights to commercialize specific products based on Mesoblast’s proprietary adult stem cell technology platform, Cephalon will make an upfront payment to Mesoblast totaling $130 million and regulatory milestone payments of up to $1.7 billion. Wilson Sonsini Goodrich & Rosati represented Mesoblast in the transaction. To read the Mesoblast press release, please visit http://www.mesoblast.com/download/267/. On October 26, 2010, Pacific Biosciences of California, a developer of single-molecule technology for biological analysis, announced the pricing of its initial public offering of 12,500,000 shares of its common stock at $16.00 per share. Shares began trading on October 27 on the NASDAQ Global Select Market under the ticker symbol “PACB.” Pacific Biosciences is focused on the market for DNA sequencing, and has created an instrument platform to help scientists observe nucleotides being added to DNA in real time. Wilson Sonsini Goodrich & Rosati advised Pacific Biosciences in the transaction. To read the Pacific Biosciences press release, please visit http://www.pacificbiosciences.com/assets/files/PacBio_PricingRelease_FINAL.pdf. On October 4, 2010, VIVUS, a biopharmaceutical company developing innovative, next-generation therapies to address unmet needs in obesity, sleep apnea, diabetes, and sexual health, announced that it has entered into an asset purchase agreement with Meda, an international specialty pharmaceutical company, for MUSE, a treatment for erectile dysfunction (ED). Under the agreement, Meda will acquire the MUSE assets, including the United States and foreign MUSE patents, existing inventory, and a manufacturing facility located in Lakewood, New Jersey. The acquisition price is $23.5 million, which includes an upfront cash payment of $22 million. VIVUS is eligible to receive a one-time milestone payment of $1.5 million based on future sales of MUSE. Wilson Sonsini Goodrich & Rosati represented VIVUS in the transaction. To read the VIVUS press release, please visit http://ir.vivus.com/releasedetail.cfm?releaseid=513896. On September 28, 2010, Amyris, which is building an integrated renewable products company by applying its industrial synthetic biology platform to provide alternatives to select petroleum-sourced products, announced the pricing of its initial public offering of 5,300,000 shares of its common stock, at $16.00 per share. The common stock now trades on the NASDAQ Global Market under the symbol “AMRS.” Morgan Stanley, Goldman Sachs, and J.P. Morgan Securities acted as joint book-running managers for the offering, while Itaú USA Securities and Stifel Nicolaus Weisel acted as co-managers. Wilson Sonsini Goodrich & Rosati advised the underwriters in the transaction. To read the Amyris press release, please visit http://www.amyrisbiotech.com/en/newsroom/168-press-release-amyris-announces-pricing-of-initial-public-offering. Of particular relevance to The Life Sciences Report, Dow Jones VentureSource ranked the firm No. 1 in the U.S. for issuer-side deals in the medical device industry. 1Based on firms with 15 or more financings over the time period. Wilson Sonsini Goodrich & Rosati’s 19th annual Medical Device Conference, aimed at professionals in the medical device industry, will feature a series of panels and discussions addressing the critical business issues facing the industry today. *Please note the new venue for this year’s event. Phoenix 2011 will mark the 18th annual conference for chief executive officers and senior leadership of medical device and diagnostic companies. The event will provide an opportunity for top-level executives from large healthcare and small venture-backed companies to discuss financing, strategic alliances, and other industry issues. Casey McGlynn, a leader of the firm's life sciences practice, has editorial oversight of The Life Sciences Report and was assisted by Elton Satusky and Scott Murano. They would like to take this opportunity to thank all of the contributors to the Report, which is published on a semi-annual basis. constitute professional advice as to any particular situation.